Powers/Abilities: Asagi had a psychic link to Gamera- she keeps him mindful of humans, gives him power and has the empathic ability to know what he's thinking and feeling. She was able to revive him when he seemed dead, using the hope and energies of a gathering of children (or that's what it looks like, anyway). In the early days of the link, they were so greatly linked that she would also feel his pain and receive his wounds; by 1996, this had ceased. Though her link was severed, she still had some connection to Gamera in 1999 - she had a rudimentary empathic understanding of him and was able to get him to revive Ayana. 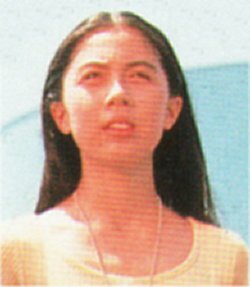 History: A dedicated and empathic young girl, Asagi came into contact with the Atlantean oryhalcyon beads and thus gained psychic link to Gamera. She kept him grounded in humanity and helped him in battles, also assisting in proving Gamera was on humanity's side. When he was hideously wounded in the battle against Legion, Asagi was able to use her link to revive him (with the assistance of the hope of small children) but the link was severed in doing so. Comments: Asagi is played by Ayako Fujitani, daughter of Steven Seagal; this was her first role in acting. Thanks to Charles Ellis for this profile and images.